In between weddings, ladies corsages and remembrance flowers, we’re busy getting ready for the Isle of Wight Vintage Fair this Sunday (25 September 2011). As well as the Jaybirds Flowers stall, we’re excited to meet other local businesses including Vintage Vacations, Retro Roobys, Oh So Vintage, Infamy Infamy, Rockabilly Noo’s Rockin’ Treats, Smith & Stephenson, I Heart Buttons, Cinderella’s, Vintage Hair Lounge, Vintage Cake Company, The Sisters Grim, CL Events, and Island Memories. The Isle of Wight is a wonderful place for weddings and celebrations, with a wealth of unique suppliers and miles of gorgeous coast and countryside. With a second home in Cowes, we’re often asked to create vintage and retro themes for weddings and parties here, and this will be a great opportunity to show you how flowers can set the mood for any event. 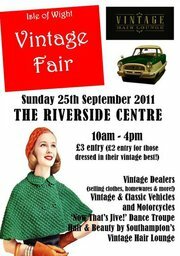 Look out for us at the Riverside Centre, The Quay, Newport, PO30 2QR this Sunday.